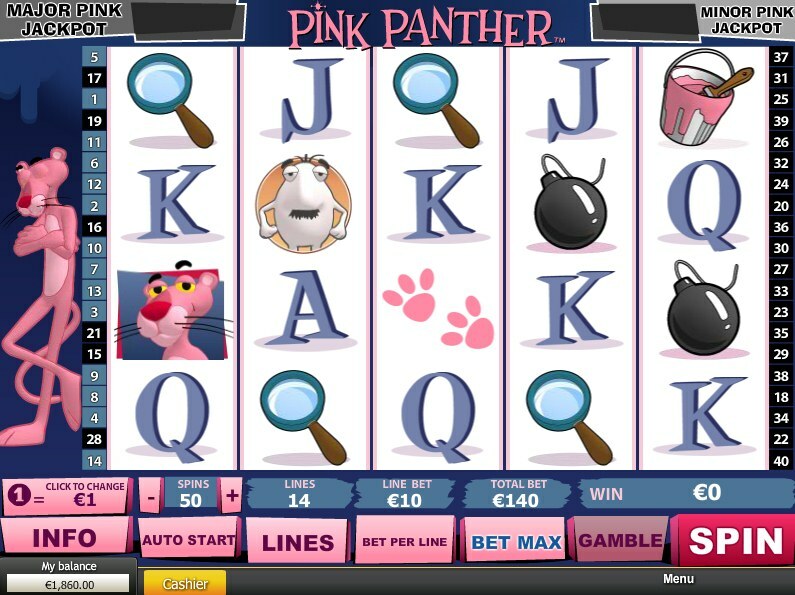 Online slot developer Playtech made a big song and dance about the release of this, their cartoon themed-slot Pink Panther, as it came out alongside the release of their other big tie-in, Rocky, which was based on the boxing exploits of the popular Sly Stallone character. As has since been established, however, it’s Pink Panther that has proved to be the real knockout. Fun and frantic, just like the cartoon series the slot is based on, the game features a bundle of bonus rounds and two progressive jackpots. The song and dance was justified. 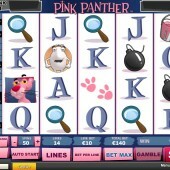 Pink Panther is a 5-reel, 4-row, 40-payline slot, with the customary Wilds and Scatters all here and a big betting range, starting at $0.01 (don’t worry, high rollers are also well catered for in this game). If you’re a fan of the original TV cartoon series, there’s no need to worry that any of the humour or cool of the series are missing – they’re not. Early ‘60s style oozes out of every pore of this slot, and the funky music keeps things ticking along nicely. All your favourite characters are here on the slots, including Inspector Clouseau, the Little Man, paint pots, the Inspector’s magnifying glass, our hero’s pink paw prints, and cartoon bombs galore, alongside the usual 10-to-Ace symbols. The Pink Panther Wild substitutes all other symbols save the Scatter. The Pink Panther also features in the Scatter symbol. Get three or more of these anywhere on the reels and you’ll bag yourself 5x your stake for three Scatters, 25x for four pink pussies, and 125x for five of the hip cats. As we mentioned at the top of the review, Pink Panther has bonus rounds galore and these only add to the overall appeal. Each of the games is triggered randomly during gameplay. The Pink Trail Bonus game sees us helping out the hapless detective, Inspector Clouseau, as he heads out on the trail of the legendary Pink Panther diamond. As he takes one step forward you’ll be awarded a prize. Decide then whether to stop and collect your prize, or continue to try to accumulate more money but risk halving your overall bonus if he falls into a trap. Finding that elusive diamond, however, will see your haul doubled. In the Crack the Pink Code bonus game you’ll see ten locked safes in front of you. Each safe contains either free spins, multipliers, or a Wild that can be used during your free spins. Keep picking safes until a dynamite symbol appears, exploding to comic effect to signal the end of the round. The Pink Pow! Bonus, meanwhile, does what is says on the tin with the Pink Panther leaping into action to blow up symbols at random. Anything from two to six symbols will turn into Wilds. The Color Pink Bonus Game sees a character loved by anyone who was a fan of the TV show. The Little Man and the Pink Panther will paint a wall of numbers – the Little Man painting his blue, the Panther painting his pink. At the end of the sequence, the total of all the numbers in pink is worked out to decide your payout with the player being offered the chance to gamble and continue on. Finally, the Wheel of Pink Bonus Game sees the Pink Panther spinning two wheels. The outermost wheel selects a cash prize whilst the internal wheel selects a re-spin or Collect icon. This means wins can be increased over each round and never lost. The biggest treasures, however, lie await in the Jackpot Adventure game, with its two progressive jackpots and a consolation prize should the player not manage to bag one of the big prizes. Randomly triggered during the game, you have to choose from 12 closed doors which open to reveal various Pink Panther characters. Five Pink Panthers bags you the Major Pink Progressive, four Inspector Clouseau symbols trigger the Minor Pink Progressive, and three Little Men the consolation prize. And when you consider the big bets allowed in this slot, those progressives can get very big indeed. Big jackpots, big bonus features, and a faithful tie-in to a classic series: Playtech have been there and done it, of course. With these big-money tie-ins you know you’re going to be taken care of, and fans of well-made slots, as well as fans of the Pink Panther, will enjoy this game. If you want to experience some other themed slots from Playtech we recommend the movie-themed Gladiator slot or something from their range of Marvel slots such as the comic book-themed slot X-Men.